Pimm's SconesThese tasty Pimm's and clotted cream scones are the perfect accompaniment for a summer's day. Summer is the time for fresh fruit, clotted cream teas and pimms! So what better than both mixed into one with a clotted cream tea with pimms infused summer fruits. 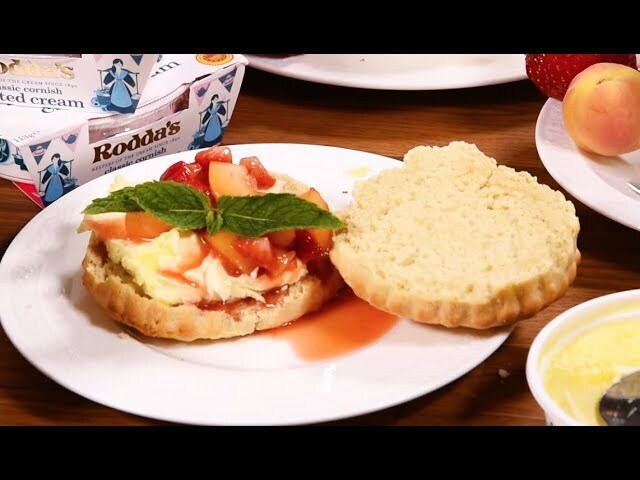 Prepare to impress others with this zesty, clotted cream teas, that will take Pimm’s O’Clock to the next level! Heat oven to 220C/200C fan/gas 7. Cover a baking sheet with baking parchment. Stir in the sugar and lemon zest. Make a well in the centre of the flour mixture, then pour in the milk. Use a knife to bring the dough together. Tip out onto a lightly floured work surface and bring together with your hands. Bake for 10 mins until risen and the tops are golden. Mix the Pimm’s and caster sugar in a bowl. Halve the cooled scones. Top with clotted cream, infused fruit and mint leaf.